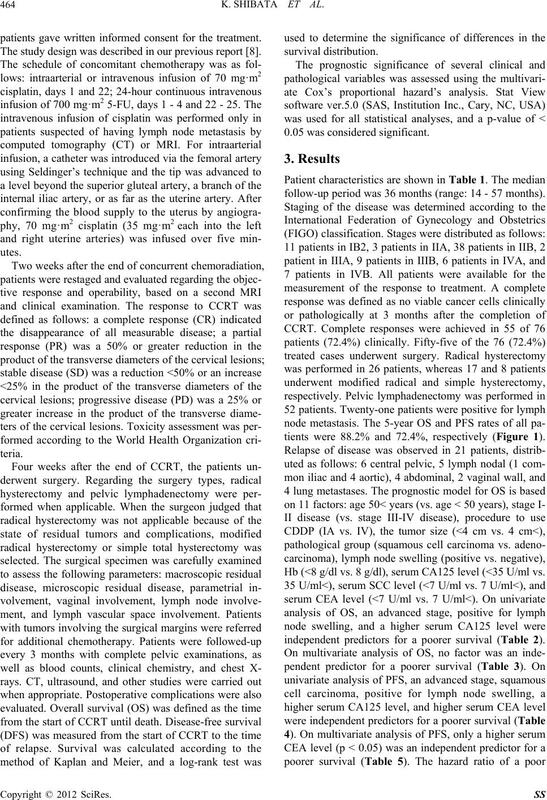 well as recurrence as compared with smaller tumors [2,3]. factors indicating a poor prognosis. patients gave written informed consent for the treatment. The study design was described in our previous report . follow-up period was 36 months (range: 14 - 57 months). tients were 88.2% and 72.4%, respectively (Figure 1). 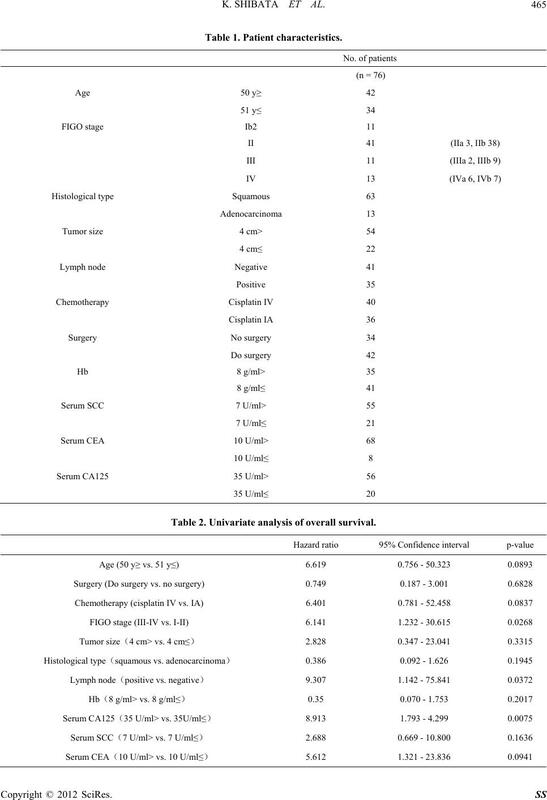 Hb (<8 g/dl vs. 8 g/dl), serum CA125 level (<35 U/ml vs.
independent predictors for a poorer survival (Table 2). Table 2. Univariate analysis of overall survival. Table 3. Univariate analysis of progression-free survival. Table 4. Multivariate analysis of overall survival. Table 5. 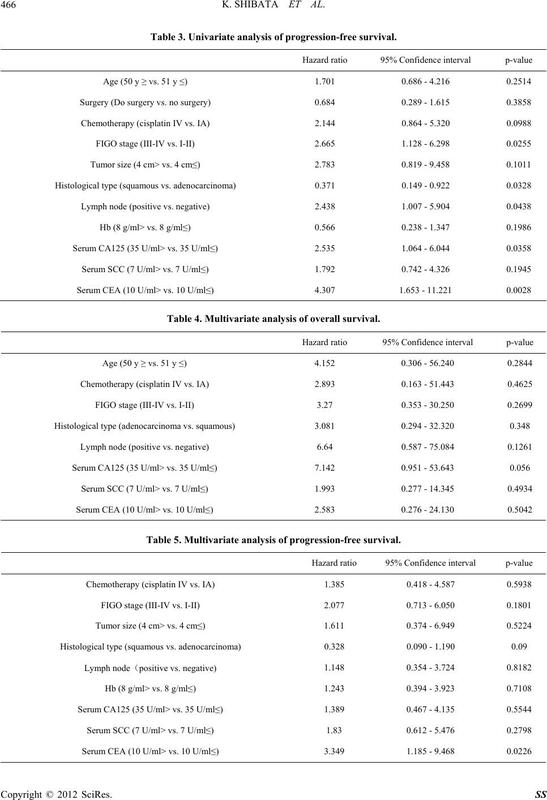 Multivariate analysis of progression-free survival. 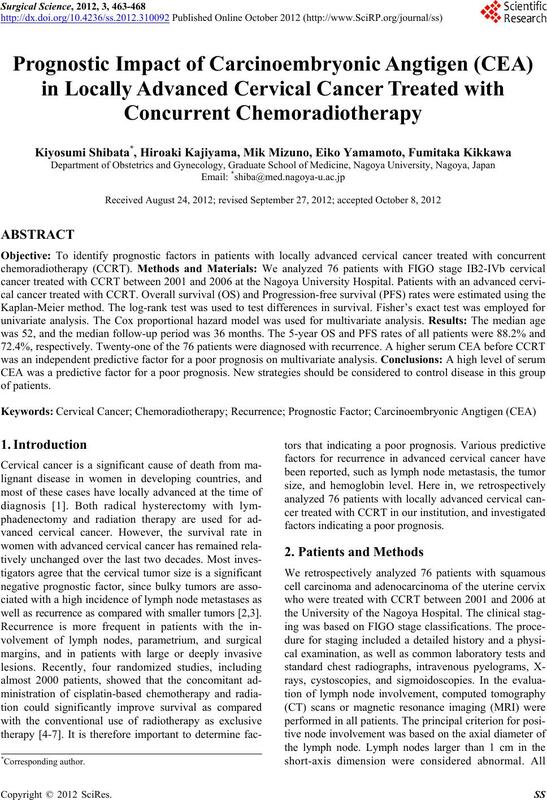 with locally advanced cervical cancer treated with CCRT. OS (a) and PFS (b) in all patients. was 3.49 (95% confidence interval [CI], 1.185 - 9.468). We reported the effects of CCRT in our previous study. investigated the outcome after each surgical procedure. and CA125 are at high levels. 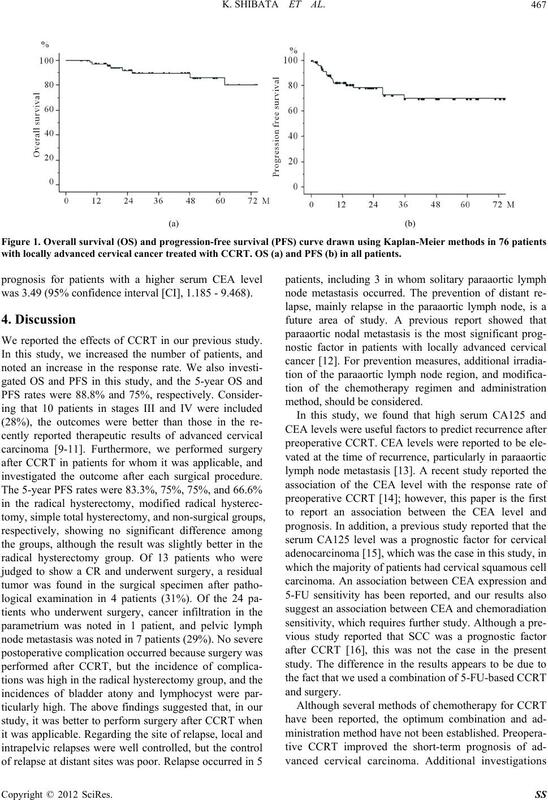 cer Statistics,” CA: A Cancer Journal for Clinicians, Vol. 55, No. 2, 2005, pp. 74-108. Oncology, Vol. 107, No. 2, 2007, pp. 310-315. Vol. 41, No. 2, 1998, pp. 307-317.
of Medicine, Vol. 340, No. 15, 1999, pp. 1154-1161. No. 8, 2000, pp. 1606-1613.
tion, Vol. 57, No. 2, 2004, pp. 93-99. Clinical Oncology, Vol. 17, No. 5, 1999, pp. 1339-1348. Oncology, Vol. 20, No. 4, 2002, pp. 966-972.
logic Oncology, Vol. 95, No. 1, 2004, pp. 145-151.
nal of Radiation Oncology, Biology, Physics, Vol. 28, No. Vol. 107, No. 1, 2007, pp. S23-S26. 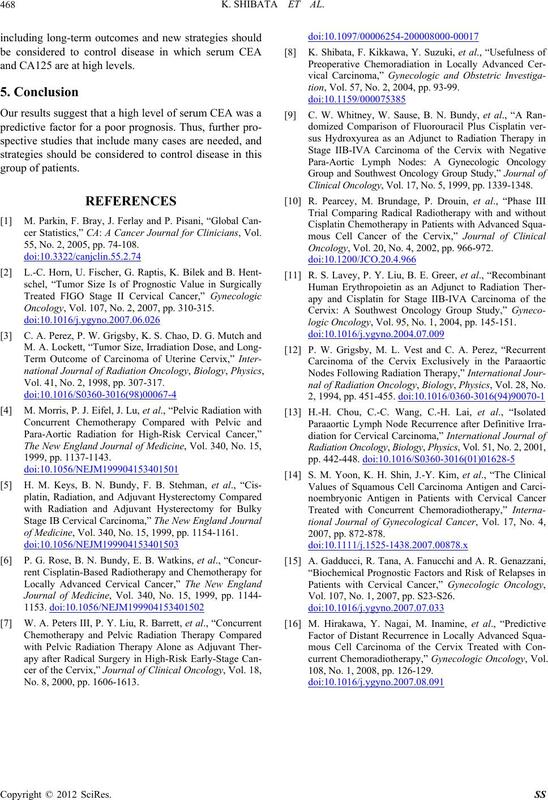 current Chemoradiotherapy,” Gynecologic Oncology, Vol. 108, No. 1, 2008, pp. 126-129.